Anthony Joshua retained his IBF Heavyweight title after knocking out Eric Molina in just third round on Saturday night. It was a typical Joshua like fight where he started careful and assessed Molina’s negative tactics and pretty much unleashed at the start of third round and knocked down Molina who got up but flurry of punches forced referee to stop the fight. The fight was a disgrace to say the least as Molina never threw a punch and went into the shell from minute go. But the best part came after the fight when Eddie Hearns invited Wladimir Klitschko into the ring and officially announced Joshua vs Klitschko for April 2017. Anthony Joshua is set to take on Eric Molina for the IBF heavyweight title showdown in Manchester Arena on Saturday, 10th December 2016. 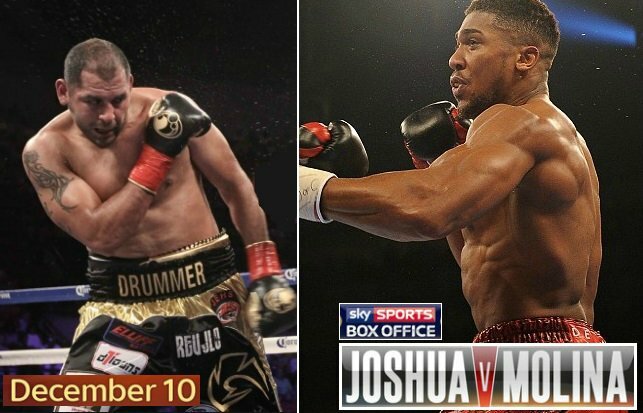 It will headline the Sky Box Office PPV event which also feature couple of other exciting fights on the undercard. Dillian Whyte takes on Dereck Chisora for the all british heavyweight fight which has produced alot of fire works already in the build up to the event. The coverage starts early in the evening on SkySports 1 at 17:00 uk time which the coverage goes to PPV encryption at 6 pm uk time. You can buy the PPV from Sky Box Office priced at around £16.95 / €21.95 via their official website (my.sky.com/orderboxoffice/) or by telephone. Although Joshua vs Molina is not the PPV worthy fight but a very loaded undercard is good enough reason to splash 17 bucks in you are in the United Kingdom. Sky Box Office will produce the live feed in HD. Joshua vs Molina Fight Night Schedule: The coverage of this loaded PPV begins at 5pm uk time starting with preliminary bouts featuring loads of British boxers where you will see the likes of Katie Taylor vs Viviane Obenauf women featherweight fight. Followed by some exciting undercards where Scott Quigg fights Jose Cayetano. Luis Ortiz takes on David Allen for another heavyweight showdown. Callum Smith also takeson Luke Blackledge later in the night. The main-event between Joshua and Molina won’t start anytime before 11:30 p.m uk time. Official Weigh-ins: On Friday, 09 December we will have the official weigh-ins for the entire card. The coverage will be available on Sky Sports or through various boxing channels on youtube. Anthony Joshua was hoping to get his first big breakthrough with a fight against Klitschko earlier in the year but that did not materialised and now he has a decent fighter in front of him come Saturday, 10th December and it should be a good fight. 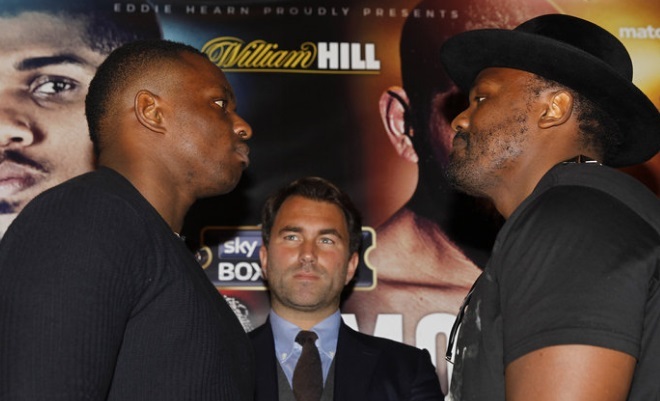 But the main attraction for British boxing fans is the co-featured event between Dillian Whyte and Dereck Chisora which has caused all sorts of controversies leading up to the big night.